Can you help me with lost, delayed or damaged luggage? Where is your import feature? AirHelp helps airline passengers to get the compensation they are entitled to after a disrupted flight (e.g. a cancellation, delay or overbooking). We have over five years experience in the flight claims industry and are proud to have helped over 10 million inconvenienced passengers – so far. AirHelp is the world leader in the fight for air traveler’s rights, and we’ve been helping air travelers since 2013, so you’re in safe hands with us. We win more flight compensation claims than anyone else in the industry, and we can help passengers around the globe thanks to our teams of legal experts in over 30 different countries. We take out all the stress of making a claim — no more lengthy back-and-forths with the airlines. We combine the knowledge, expertise, and state-of-the-art technology to pursue each claim efficiently and successfully. Plus, we operate on a no win, no fee basis, which means that using our service is entirely risk-free. Of course! If you’ve been rejected, enter your flight details in our eligibility checker. There will be sections where you can provide us with information you’ve received from the airline regarding your initial claim (e.g. any emails or text messages from the airline). We can then investigate if you were wrongfully denied compensation. If we see that your flight qualifies, we’ll pursue your claim to get you your compensation. Our mission is to help you get the compensation you are entitled to after a disrupted flight. If you submit a claim via our website, our team of experienced agents will take care of the entire process on your behalf. That saves you the stress and paperwork of claiming by yourself. You’ll also have the benefit of claiming with the world’s biggest and most successful claims company, with access to legal expertise in over 30 countries. At AirHelp we operate on a no win, no fee basis, which means that we promise not to charge you unless we win your case – even if we go to court. That means there is zero risk to you and no advance payments required. For detailed information about our terms of service, please refer to our Terms & Conditions. Yes, we do have an app available for download. However, we’ve also worked hard on making our mobile website fast and easy to use. So you can submit claims and check your status via your mobile without having to download an app. We can’t help you directly in the same way that we do for delays or cancellations, but we can provide you with information on how to recover your luggage, depending on whether it was lost, delayed or damaged. 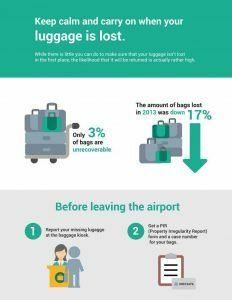 The first thing that you should do is to report your missing or damaged luggage. You should do this before you even leave the airport. Head over to our Lost or Delayed Luggage page to find out exactly what you can do to make a claim. We have discontinued our import feature to focus on other areas of our website. Don’t worry, we remain committed to our core service and mission — helping air passengers. You can still find out if your flights are eligible for compensation by entering their details in our eligibility checker.